Two people were seriously injured when a car and taxi crashed, before the latter careered into a building. Cleveland Police said the Skoda Octavia taxi smashed through a brick wall at an industrial unit after "receiving contact" from a Ford Focus which was following it. 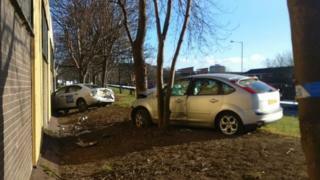 The Focus also left Derwent Street in Middlesbrough and crashed into a tree at about 02:30 GMT on Tuesday. The force said two male passengers from the Focus had fled the scene. The driver of the Focus sustained serious injuries and is being treated in James Cook University Hospital. The front seat passenger of the taxi is in the same hospital after suffering serious spinal injuries. Other passengers in the taxi also suffered minor injuries. Police have appealed for witnesses and are trying to trace the men who fled.